Now that we’ve upped our longer walks to every three days, it’s been difficult to find new walks close to home. Red Rocks, though awesome, is clear across town and a 40 minute ride away, and the same holds true for Lake Mead. Plus, we’ve done these walks several times already so it seems like ‘same old, same old’. Kingman was great, but again, it’s 100 miles away; not quick access, especially if we have other plans or chores for the day beyond the walk, which we usually do. We’ve been looking for something with easy local access that wouldn’t tie up our day, but still give us the miles we needed. The padlocked gate with the No Trespassing sign might have been a subtle hint that we weren’t supposed to pass through, but scofflaws that we are, we managed to walk on and avoid apprehension. 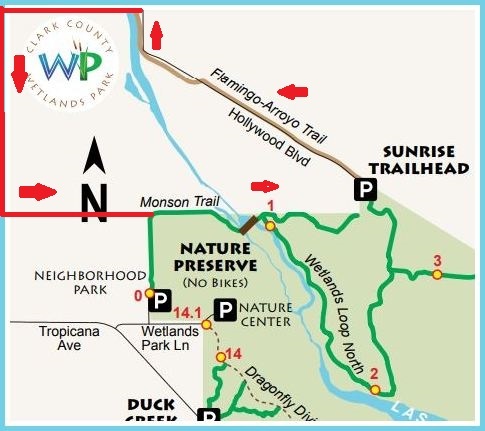 When we walked to Wetlands Park from home last time, we discovered quite by accident that we could avoid walking on several main roads by walking through the local equestrian/dog park and taking a dirt road that we were probably not supposed to walk on. The locked gate with a large No Trespassing sign was a subtle hint, but we managed to work our way around it. The road continued along a drainage channel behind a housing development and meandered its way into the Wetlands Park, as did we. The Upper Diversion Weir Bridge is one of only two access bridges across the Las Vegas Wash in the Wetlands Park. We followed the dirt road until it intersected with the paved Monson Trail which subsequently intersected with the Wetlands Loop Trail over the Upper Diversion Weir Bridge which then intersected with the Sunrise Trail which, in a short distance, merged with the Flamingo Arroyo Bike Trail which runs along the Las Vegas Wash to Vegas Valley Road which connects with Cabana which gets us home. Doesn’t this make you think of Dem Bones? The ankle bone connected to the shin bone, the shin bone connected to the knee bone, the knee bone connected to the… you get my drift. Anyhow, this network of interconnected trails has become a go-to favorite of ours because it’s accessible, pretty much avoids traffic and it’s a 9-mile loop from our house… back to our house. We do have to walk along busy roads for about a mile or so, but it’s on sidewalk and not particularly treacherous… plus I nearly always find a penny or two along this stretch. Cinnamon teal - Red eyes!! Common merganser - what a do! En route, there always seems to be a diversity of things to see. Birds are plentiful in the Wash, especially in the channel and by the Weir Bridge. In addition to the usual suspects like coots, mallards, gallinules and Canada geese, we also saw cinnamon teals, cormorants, herons, ibis, snowy egrets and common mergansers. Raptors, probably hawks, were circling far overhead. A great place to enjoy a cup of coffee along the way. Along the way, there are a few respites for a brief rest and a cup of coffee. We’ve been taking thermos cups with us along with protein bars to maintain our energy and because we usually leave the house before having breakfast and our fill of morning coffee. Not an appealing nap spot! The bad news? The rubbish and trash along the way. From entire back car seats (this was not a park bench) to a mattress (not inviting enough for an en route nap) to abandoned homeless dwellings, we saw it all… a continuum of unwanted, carelessly discarded rubbish. Plastic bags of every color, shape and size are the most common and worst polluters. Mostly, however, it’s the accumulation of plastic bags of every color, shape and size, some complete with their trash contents, that’s most noticeable. We understand why some states, like California, have banned plastic bags at most stores. The Las Vegas Wash is subject to flash floods and when the rains come, the water rises significantly, carrying with it all the collected debris. When the waters subside, the bags remain, caught on the limbs and branches of the trees, shrubs and bushes that line the Wash. Not a pretty sight. In fact, it’s downright disturbing. It’s too late for us to do anything about it now, but perhaps when we get back from our ‘big walk’, we’ll see if we can’t round up some volunteers for a clean-up. It will take lots of manpower to clean up the several miles of trash-laden shoreline, but you have to start somewhere.